IlyaM (8k): This is the position from the game I recently played. Unfortunately I don't remember well whole board position so I'm showing only the corner. I played kikashi and I was expecting the response at a. surprised me and I failed to came up with good follow-up. What is the best sequence for Black here locally? Bill: What's wrong with ? 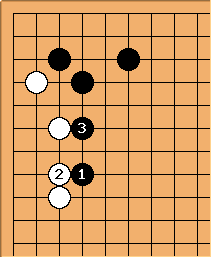 If , looks OK.
White has several weaknesses, such as a and b. Note: Isn't the right place for kikashi usually a in the original diagram, threatening b, either as a cross-cut or a hane? Charles This is a follow-up to the 4-4 point low approach low extension, slide, 3-3. 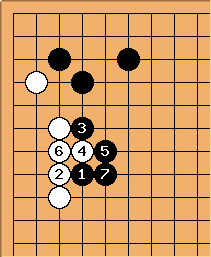 We could do with a 4-4 point low approach low extension, standard joseki, follow-ups? page, considering that this is perhaps the most common joseki, currently. I believe the play below is more common than Bill's suggestion. Obviously there are a number of ideas in the position. If Black at a in the original diagram, then White at c is taught as an answer. 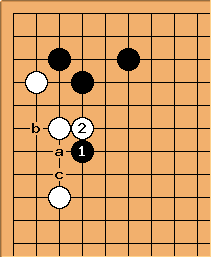 Looking at pro games, Black a is not so frequent; and White at c is not at all common. A possible conclusion is that pros only play at a when the response at c isn't good enough. If one wants to isolate this white group from the centre, this sequence may be what you were looking for. And the white group in the centre (not shown in the diagram) dies. Charles there is not the usual play. 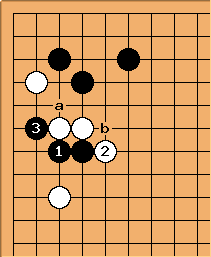 In this position is the normal idea, not helping Black to develop the kikashi stones , but defending White's shape.